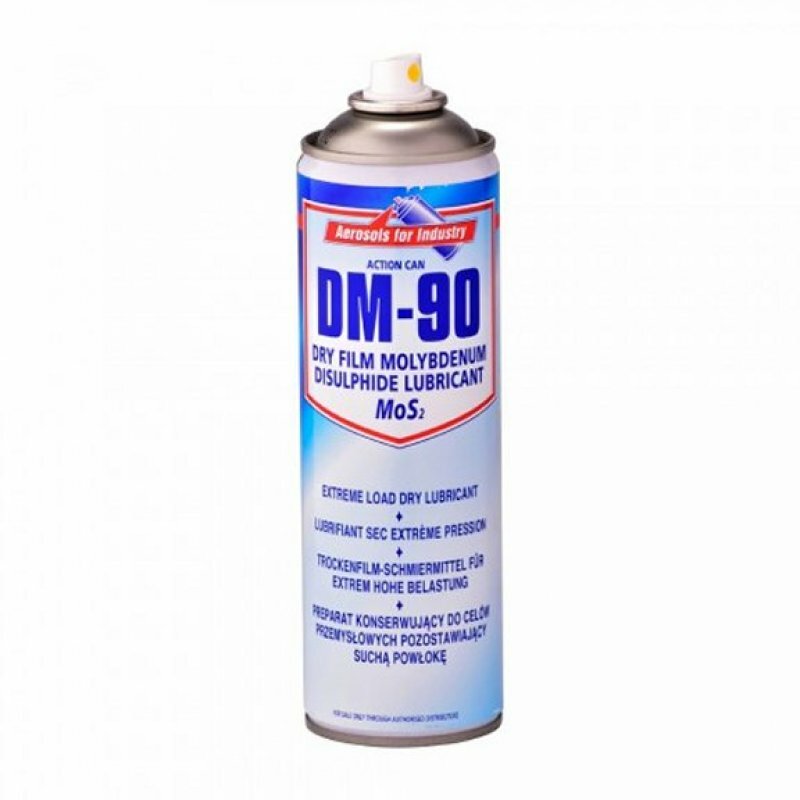 DM-90 Dry moly spray is a solid dry film lubricant composed of molybdenum disulphide MoS2. Molybdenum disulphide has a low coefficient of friction and is effective in forming a low friction surface which is resistance to corrosion. The DM-90 formulation has a very high content of molybdenum disulfide. 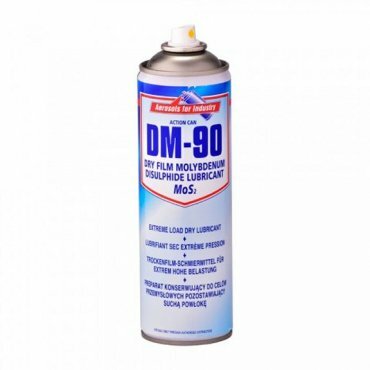 DM-90 is ideal for use on surfaces that are not suitable for liquid, wet, and or damp lubrication. DM-90 Dry moly spray is resin bonded to withstand high loads, pressure, and temperature. DM-90 does not attract dirt and dust as it dries to a non oily, non sticky finish. Dry moly spray is black in colour. DM-90 is ideal for use in machine shops, mills, mining, construction, transportation industry, refineries, industrial gaskets, bearings, printing and other locations where a wet lubricant is not acceptable and where heat is present such as cams and gears. DM-90 is quick drying. Prevents fretting, scuffing, galling, seizing, and corrosion. Use as a dry film lubricant on sliding surfaces gears, bearings and as an anti-galling lubricant on precision threaded components. DM-90 is formulated to dry quickly and still give excellent resistance to seizing. Temperature range -50 degree C to +450 degree C. DM-90 withstands alkalis, oils and most acids. The DM-90 dried film can be polished to give a clean, super hard, non slip surface coating suitable for chutes and tracks in workshops and factories.